Integrations and partnerships take the spotlight from video conferencing providers such as Lifesize, Highfive, Zoom, Polycom, Google, and Videxio. Like Highfive, Zoom Video Communications is committed to growth through partners -- and in a nod to that strategy, the company has created a channel charter aimed at furthering its go-to-market program for its software-based Zoom Rooms solution. Via the program, Zoom expects to be able to "tackle new customer segments, use cases, and markets," said Laura Padilla, head of business development and channels for Zoom, in a prepared statement. The channel charter adds to March integration moves, in which Zoom announced a technology ecosystem program and certified integrator program, as well as an agreement that has IBM not only reselling the Zoom video meeting technology but also embedding it into its Watson Workspace Plus collaboration tool. In one of a couple of announcements coming out of InfoComm, Polycom has tightened its year-old partnership with Zoom, through which it'd been supporting Zoom meetings on its Group Series and Debut video solutions. Today the company adds support for Zoom Rooms from its Trio conference phone. 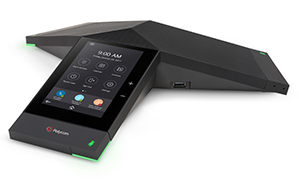 Polycom Trio can now run the Zoom controller interface natively, allowing the full Zoom Rooms control experience in any sized conference room, the company announced. In the U.S., the Zoom Room bundles will be available in July from CDW and Insight. Availability in other regions will follow later this year, Polycom said. Separately, Polycom announced that Trio will now be able to run high-end capabilities needed in larger meeting rooms and conference spaces. These include facial tracking, dual monitor support, advanced audio coverage, and simplified content sharing, via integration between Trio and Polycom video codecs. And, it announced a guest access feature for Polycom Pano, its wireless content sharing system. Like others, Google has been slowly amassing integrations that beef up its communications and collaboration platform. The latest of these are meant to improve the meeting experience, shared Rany Ng, director of product management for G Suite, in a blog post highlighting new integrations for Hangouts Meet, Google Calendar, and Hangouts Chat. For Hangouts Meet, Google has partnered with video conferencing interoperability specialist Pexip with the goal of easing the challenge of joining Hangouts Meet meetings from existing video conferencing equipment, Ng wrote. Via Pexip, users will be able to join meetings on Hangsout Meet using preferred video conferencing equipment from traditional vendors such as Polycom and Cisco. Google also has committed to supporting third-party conferencing natively in Google Calendar, Ng wrote. Via these integrations, users will be able to create, view, and join -- via the Web or a mobile device -- video conferences directly from Calendar. Among the companies developing Calendar add-ons are Arkadin, Cisco, Dialpad, GoToMeeting, LogMeIn, RingCentral, Vidyo, and Vonage; once ready, the conferencing add-ons will be available in the G Suite Marketplace, Ng noted. For the Microsoft user crowd, a coming integration will allow users to join Hangouts Meet meetings directly from the Skype for Business app. And, addressing the need for further interoperability between Google Calendar and Microsoft Exchange, users will gain the ability to book rooms, equipment, and other resources across the two environments, Ng wrote. Of course, as Ng wrote, "getting the right people in the room with the right setup" addresses only part of the meeting experience. Another critical component is real-time information sharing, which Google will address by allowing external attendees to participate in Hangouts Chat sessions.